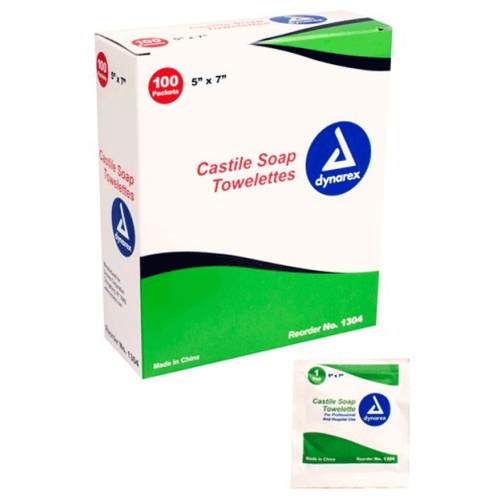 Castile Soap, Castile Soap Towelette, BUY Castile Wipe, Castile Soap Wipe, 1304. 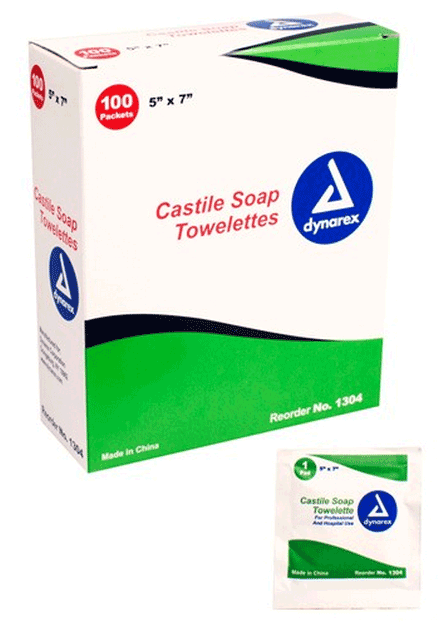 Castile Soap Towelettes, manufactured by Dynarex, are Castile Soap Wipes that are ideal for urine specimen prep, as well as, general multi-purpose use. These Disinfectant Castile Wipes are 5 x 7 inches, so they are the standard size for Hospital clean catch urine sample procedures. Castile Soap contains olive oil, so that it benefits the skin while cleaning it. These towelettes are great for cleaning your hands or as barriers from germs when touching items but thats about it. They are not as strong as I had hoped and will tear pretty quickly. However, given the price buying more will not be a hassle. Be sure to carry more than one when you go out!